Sneak Peak at "The Real World: Brooklyn"
A screen from the Real World: Brooklyn shows the crews digs on Pier 40 in Red Hook. The Brooklyn Paper got an early look at the first episode of "The Real World: Brooklyn", which has been filmed around New York City over the past five months or so. 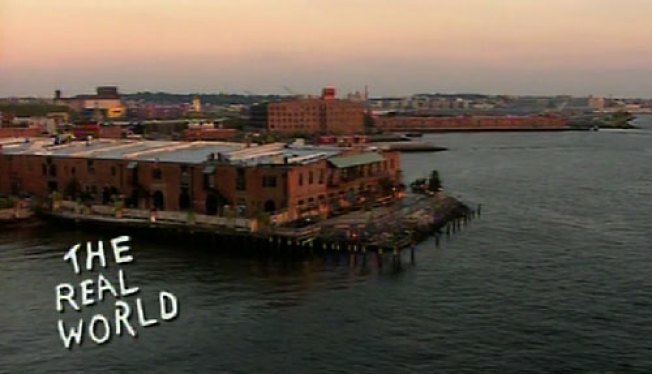 We've known all along that the cast has been living in a renovated warehouse loft factory hibrid on Pier 40 in Red Hook, but what we didn't know were the details of their MTV-decorated house. Well, now we do. Katelynn - a transgendered female who comiserates with J.D. over rough childhoods. Chet - a 23-year old Mormon with a love of American Apparel clothes, who's out to "show people that Mormons are fun." Scott - a 23-year old gym-nut who "received the designation of having the best abs on the East Coast." Devyn - 20-year old former Miss American Teen in 2005 and says things like, "it's easier to get into heaven than it is to get into Devyn." She's also the cast's sole African American. Ryan - 23-year old Army vet with a tour of Iraq under his belt. Writes in a 300-page, single-spaced journal. Baya - 21, non-mormon from Salt Lake City, Utah. The "token cute white female." J.D. - 22, sweet, gay, sensitive dophin trainer. Sarah - normal girl, has tattoos, and "seems to be the only one with an actual interest in anyone else." Based on these descriptions, and these descriptions alone, here are my predictions on potential hook-ups. Scott & Sarah in some form of water activity (hot tub, pool, shower), Baya & Ryan in a seemingly-romantic affair, Chet & J.D. in some kind of mormon-woopsie-daisy drunk thing, Devyn & an anonymous guy after a night dancing at the bar, J.D. & an anonymous guy after hours of dolphin talk and snuggles.